About to run my first fate game and we're using Secret of Cats! Love the setting, and the presentation in the book is phenomenal. Great art and flavor text! This is a lovely little FATE game, I'd recommend it for anyone who's looking to fill their nitch for playing as a magical cat. Any word on the print on demand version? We've got it in print and in game store distribution; not on demand; high quality full color printing. For sale on the Evil Hat webstore and elsewhere! This is going to provide you with a range of interesting sapient animals and terrifying threats to use in your games. It's already funded, now I'm working on racking up the stretch goals so I can buy some wonderful art from the equally wonderful Crystal Frasier. Check it out if you have a moment, and help me to expand the world of Cats! I have never played any of these games before. What do I need to know or have? Is The Secret Of Cats playable by one player? Is it a computer game? How long does it take? This is a roleplaying game that's designed to be played by a group of friends sitting around a table (or a virtual table, if they're playing online). You can't play it single player normally, but there are tools around that are designed to replicate the role of the Game Master, generating random events to allow solo play. A session can take whatever amount of time you like, but most roleplaying game sessions are at least 2-3 hours in length. To play the game you need this book, Fate Core (which is available for free from this site or as an online resource at fate-srd.com/), and four Fate dice. Fate dice are six-sided dice that produce a result of -, blank, or +. You can replicate them with normal six-sided dice (where 1-2 = -, 3-4 = blank, and 5-6 = +). I would love to get this and the Core book for my boyfriend, but we have found pdf gaming to be too cumbersome. PLEASE produce this in print-on-demand format. As mentioned (but easily missed) below, we're planning on a non-POD, full-print-run release to retail game distribution planned for January 2015. I've never played FATE before. What book(s) would I need in order to play this with my daughters? Fate Core System, first and foremost. (Fate Accelerated is very lightly used in terms of how spirits are represented, but not a necessity). Both are free/PWYW here on this site. I absolutely love this! I think that this is my favorite FATE publication of all time! I am enamored by the idea of playing as magical cats! I can't wait to run this. I would just like to thank Fred Hicks for personally taking the time to answer our questions. We have several amendments planned for Secrets of Cats, including a page of inspirations & other media that starts with John Wick's Cat. We'd left out mention originally due to word-count constraints, but it was a silly oversight on our part and we're working on correcting it. Here's the text of that section. Once we get a new art piece or two (probably a month-or-so from now), we'll be releasing an update to the PDF that includes this as well as a bunch of other fun goodies. Our ancient forebears worshipped cats and, if the Internet is anything to go by, many of us still do. I drew from a long and storied tradition of cats as heroes when writing The Secrets of Cats, and the following is a short list of works that inspired me or which draw from the same tradition. This short story, originally published in Smoke and Mirrors was one of the major inspirations for The Secrets of Cats. It’s very dark, and poetic in the way Gaiman’s writing is always poetic, and focuses on the terrible price paid by one cat to protect his family from the forces of evil. Another of my main inspirations, I’ve paid homage to Eliot’s deliciously quirky poems at various places throughout The Secrets of Cats, most obviously in The Naming Of Cats, where I tell you that a cat has not one but three names. This wonderful (and wonderfully strange) film from 1985 was the other major influence for The Secrets of Cats. If you’ve seen it you’ll know exactly which sequence I’m talking about; the deliciously creepy scenes where the cat, General, protects a little girl from the troll that’s trying to steal her breath. In addition to the main inspirations I’ve mentioned above, there are countless books, films and TV series that helped form the brain-stew that led to this book, including The Rats of NIMH, the TV shows Sleepy Hollow and Supernatural, and the Night Warriors book series by Graham Masterton. Seen it. Bought it. Love it. When can we expect the print? I'm targeting January, but if a few things come together faster, sooner. Hi folks. Trying to get myself and family into Fate. Can this story be run using FAE or should we use Fate Core? If you went with FAE you'd have some adaptation work on your hands; the magic system here relies on the granularity of the Core-qua-Core end of the Fate Core continuum. I wonder how this compares to John Wick's Cats. 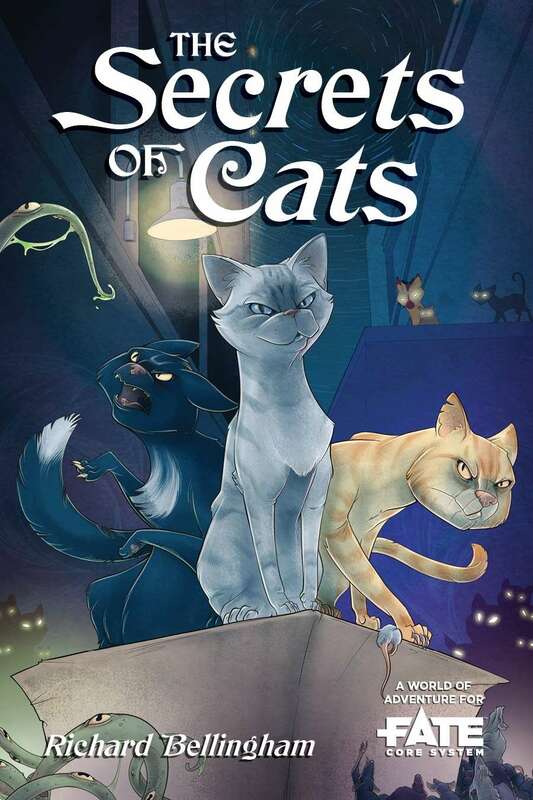 Wick's Cats is a very straightforward system and a lighthearted tone suitable for younger players; Secrets explores some similar thematic territory with the robustness of Fate and a darker (but still whimsical) tone. I am looking for a game to introduce my 10 year old daughter to RPG. We already play many board games, so it's time to move up to the good stuff! So how suitable is this for a bright, curious 10 year old? That's a difficult question to answer without knowing the ten-year-old in question. Cats sacrifice small animals to power their magic and there are also a few mentions of murder and supernatural evil, so the game is definitely quite dark in tone. A lot of kids are fine with that (delight in it, even) but of course I can't speak for your daughter specifically. If she liked Coraline and Paranorman and isn't too squeamish about cats killing birds and rodents, she'll probably be fine, but honestly the best way to be sure is to grab the book for free and have a look through it before deciding whether it's any use to you. I would say for the most part it's PG rated, maybe a 12. So how does this compare to Catthulhu? Ignoring the rule system differences, focusing purely on fluff and such. I haven't read Catthulhu, so I'm afraid I can't help much. I do know that we aren't focusing on the Cthulhu Mythos in "Secrets" so you're less likely to become gibberingly insane, I assume. I think there's also even more of a focus on secrecy in Catthulhu. Sure the cats in "Secrets" aren't meant to show what they can do to humans, but there's nothing mystical to prevent them from blowing that. "Call of Catthulhu" presents a world of chaos cults, fiendish plots, and cosmic conspiracies, all seen through the eyes of cat heroes sworn to protect human civilization -- which was the cats' idea in the first place. Game play is fast and focuses on player cleverness, feline awesomeness, and a light-hearted inversion of dark Lovecraftian themes. We call that flavor "creepadorbs." The goal of a Catthulhu game can be as simple as getting the cat treats that some two-foots stuck in a high cabinet -- but ultimately, if the Player Cats follow up over several sessions, there's always some crazy cult behind every seemingly innocent circumstance. We call that "Oswald's Razor." You can see more at http://catthulhu.com. I can't say for certain, but there is the possibility of a print run at some point in the future! Will this also get a print release? generally preffer print, but it seems interesting. We are working on a print release, which will expand the content currently available (by about 5-6 pages of appendix info & other features). Once we've got that content done and laid out we'll update the PDF offering here, and use it as the basis for the print run. Thanks for including the future updates in the PDF, much appreciated.